If you ask me to define my style in one word or even one sentence, I would probably choke. Truth be told, I don’t confine myself to only one. In my teens I went through every fashion phase possible, as many of you might have as well. My influences for a while were Avril Lavigne, Fergie and Shakira to name a few. I cringe looking back at some photos, but that “experimental” period helped shape my fashion sense and clearing up not only what I like and what I don’t like, but also what suits me and what doesn’t. Why then don’t I have a single style? If you take a look at my older fashion posts, even though they have some things in common, you realize that I don’t have that one defined style. Sometimes I like to dress up like a boho chic gal, where other times I go for more formal attire. Because for me fashion is a tool for self expression, I don’t want to be confined in one style. My mood and energy changes on a daily basis, and I feel my style should reflect that. I like being all girly in my pink sun dress, but I also love my boyfriend jeans and my rather manly sneakers. You guys know how big my love for red lipstick is, but recently I’ve been rocking grungy brown lips like the 90’s are back! Some people have one style that defines and suits them like no other, and others have many. I’m definitely one of those “others”. As I grow older, my style is in a constant state of change. Maybe one day I’ll settle for a single style… but knowing myself, I doubt it! Plus where’s the fun in that? I’d love to hear from you and your experiences. Do you have one style? Or are you like me and rather try them all? Let me know! I tend to dress more classic casual than anything.. but every once in a while I try something different! It’s alway fun mixing things up! Thank you for stopping by Angelina! Wow! You look amazing! LOVE THIS LOOK SO MUCH! Thanks Vanessa, happy Monday to you too! I guess everyone gets bored at some point and like to shake things up . Have a great start of the week Mary! LOVE this look, and I totally enjoyed reading your thoughts. I’m glad that you enjoyed it Carrie! Thanks Farrell, have an awesome week! I love this look, the mix of tailored and casual is so cute! I definitely know what you mean, one day I could be wearing pumps and the next I could be wearing trainers, but thats what makes fashion so fun!! I’m glad you liked it Maija! And I totally agree with you, that is what makes fashion so much fun! Girl I can totally relate to this post! I change my style, my hair my home decor lol everything CONSTANTLY! I always say I have commitment issues haha! I get bored so easily, and love switching it up in my life! I love this outfit! You look gorgeous and styled it perfectly! I love the boyfriend jeans with the fringe heels! Super cute! I hope you have a wonderful week beautiful! Unfortunately I’m not so adventurous when it comes to my hair, I’m just to attached to it haha! but other than that, everything is a constant change, but it’s fun! I’m so glad I found your blog, and I so happy you liked this outfit Alethea! In love with the blazer!! Happy Monday Doll!! Ps: I’m hosting a Giveaway. I’d love if you entered! Unfortunately, your link is broken Taislany, but I’ll search for your blog. I’m happy you loved the blazer, have a great week! I love this look, you look stunning! Thank you Violette, so sweet of you! Love the blue details in this look. So amazing! 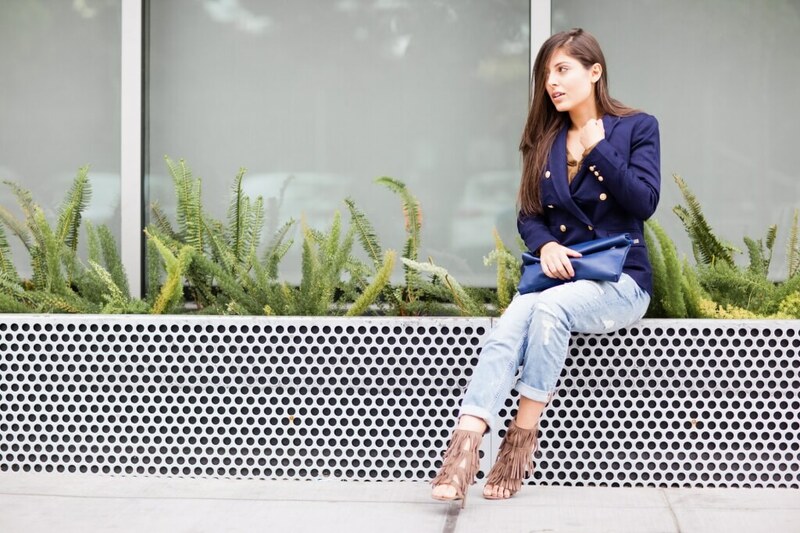 Love these relaxed boyfriend jeans with this classic blazer! Perfect mix of style and dying over those heels! Thanks Katherine, I’m glad you like the style mix! This is an awesome outfit! I definitely have more than one style which is what I love about fashion. Thanks Amy, have a wonderful new week! Such a great post! My style is always changing! Thanks Molly. That makes two of us! I absolutely agree with you, mixing styles is be fabulous and fun! Thanks for stopping by, and have a great week! So since I’m much older—let me weigh in on this “one style”. I’m very much like you (even now) and I always spout out that my personality isn’t one sided so why should my clothing style be only one way? I bet you’ll always like variety—and I think that’s a good thing! I’m actually happy to know that this is not just a phase and that I can always have more than one style! It’s definitely more fun and refreshing that way! Thanks for stopping by Jodie, have a great week! I’m so happy that you loved Kate! I also feel it’s important to always be creative even in your style! You look beautiful! Lovely pair of sandals, and a great blazer. I am like you with one style – I don’t think I can ever settle on just one style. We people are complex creatures, and it’s just fun to play with more than only a box of crayons. 🙂 Thank you for stopping by and leaving a kind comment! I love how you said “it’s just fun to play with more than only a box of crayon”. You summed it up perfectly! hey girlie! your blog is ultra fab! Thanks so much for your blog love over on mine too! Really appreciate it! p.s. I will be pinning some of your fab pictures! Oh so sweet of you Katelyn! Have a great week! My style during winter is warm hahaha I’ll wear anything and everything to stay warm ! Thanks for stopping by Krisztina! I’m glad you do Zorica! Thank you Allison! I’m glad you liked the look! Thank you for stopping by Camille, have a great day! Love your fabulous outfit, love your blog as well, thank you for sharing, you look gorgeous!!! Thank you Nora, so sweet of you! I’m glad you do Taylor! Great post babe, enjoyed reading it! And I love those heels!! I’m happy you enjoyed it Adi! Amazing look! I can relate to you, my style is ever evolving and I am not ready to commit to one signature look, I love to experiment and play with fashion. I’m always happy to find like minded people! I’m glad you can relate! It is so hilarious looking back at those pictures. Some of them though make my eyes hurt, I mean bright blue eyeshadow, what was I thinking? hahaha silly teenage self! I don’t think I would be able to define my style with just one word but I may be able to do it one sentence since my style has evolved to a place where it’s more settled now. Fabulous outfit! That shade of blue looks smashing on you! Thank you Rowena, maybe one day my style will evolve like yours, maybe not… we shall see! Thank you Biana, I’m glad you like them! Oh ! you’re so sweet Christianne. We are just talking about how our style has evolved over the years, especially since starting the blog. It’s fun to mix different styles into your wardrobe. There are so many out there, why do we have to just pick one? Such a great look! Love the striped detailing on the jacket! Even if I wanted I couldn’t just pick one, I’ll get bored quickly! My style changes day to day so I loved this post, it really resonated with me! I’m glad you were able to relate to this post Kelly! I think my style has evolved over the years, and I love that it has! This is a great blazer, the detail under the collar is perfect! Totally feel you- I have to have variety! Loving how you styled that blazer and how it looks like a sporty blazer. So so cute! Total perfection! :Love this look doll! Have a wonderful day! I love that blazer! super cute look! I love your look, especially the shoes! You have amazing style. I kind of feel like you where I like so many different things and I like to mix and match different genres of style as well. Love these jeans and those shoes, so pretty! So agreed that you can have more than one style – that’s your style! I am in love with that blazer/jacket combo. Perfect for this post! I agree that it’s fun to experiment with different looks! Your outfit is so great for a petite person… you styled the jeans and blazer perfectly with those fringe shoes! Love it! You look ah-mazing! Love this look so much! I like that you’re not afraid to mix things up and have fun with fashion. I think in my case, I’ve naturally gravitated towards a more minimal aesthetic, but definitely add several trend-driven items to my wardrobe every now and then as well! I totally agree with you! My style changes from one day to the next, depending on my mood, and there’s nothing wrong with that! I definitely have more than one style too. Love the mix of classic and edgy! You look amazing!! Totally rocking this outfit! I am the same way and don’t have just one style. I dress based on my mood. Your style is literally PERFECTION! I love it every time! Pretty much all my jeans are from Zara. Obsessed with their jeans! Totally loved this gorge outfit. You look amazing. I can certainly relate to you in the regard that I don’t have one definitive style either. I like to experiment with various styles and vibes and I think I tend to have this sort of preference to other areas of my life, such as home decor and food (I love all kinds of food). As for your outfit, I love it! That blazer looks wonderful on you! It’s so unique in that it has a sporty element with the striped collar, great find! Thanks so much for sharing and I hope you’re having a great start to your week so far! 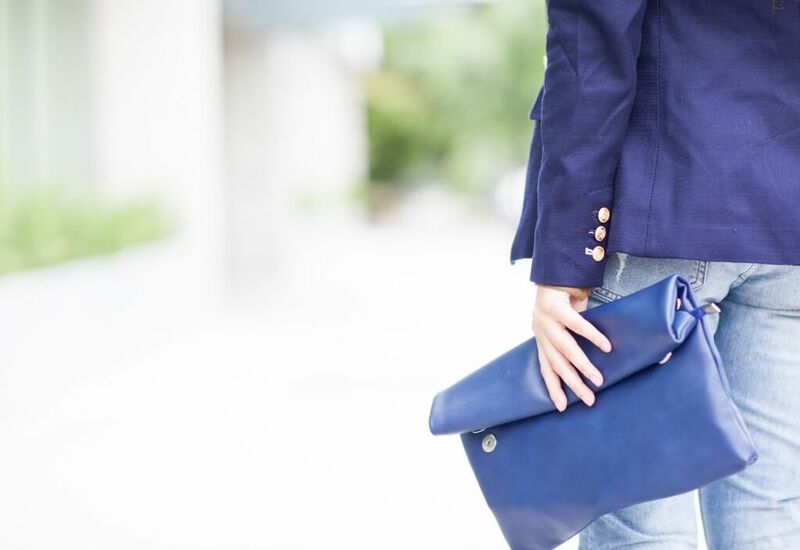 Love your blue clutch ! I definitely have contradictory styles…I’ll be totally bohemian one day and preppy the next. It all just depends on how I’m feeling on any given day! I love, love, LOVE your sandals! I also believe that you don’t need to stick to one style. Just wear what you love and you are comfortable with. Such a great post–and so true! I totally agree with you that is fun to have more than one style theme you stick to, but than again I think that it’s also important to have your personal style and to always add your personal touch to every outfit. I completely agree. I always use to try and fit my style into a rigid category, opting for only things I thought were “preppy” enough. Over the last few years, I’ve learned to just wear what ever it is I like, to pair unexpected things, and have fun with fashion. Great post! I agree, it’s awesome to have versatile style and being able to dress how you feel. Oh, gotta love those Banan Replublic jackets! You look super chic and effortless. I love your choice of heels with the outfit. I’m totally in love with this outfit, especially the blazer. And I can’t even express in words how much I agree with you on confining ourself to only one style. Why restrict yourself to one when you can enjoy all of them. As long as you are comfortable and feel good in what you wearing, you should go for it. It’s like you are speaking my mind there. Love this post! I totally get this. I don’t think I’d ever be able to use one word to define my style. I love bright colours and patterns but there are some days when I prefer to opt for minimalistic looks. when i was a teen i was way to experimental too. Fashion should not be restricting. I love the way you look, very stylish indeed. Yes to this! My style is ever evolving, and I think that’s a good thing! I adore this post!! While I was pretty borish in my teen years (jeans, a white tee, and some color zip-up hoody? Yes please! BLECH)… as I’ve grown up, I definitely appreciate a variety of “styles” from boho, to casual cute, to edgy and ultra-girly. So glad I’m not the only one who feels they fit into several style categories. Or no category at all. HA!